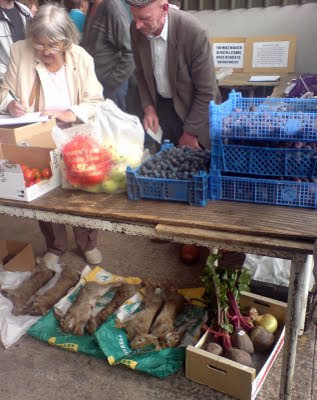 I went along to the mid-week market at the nearby village of Penkridge today. There was an auction of local produce going on; hens, ducks and geese were to be sold and the cages with the animals inside were stacked up to form the walls of the outdoors auction room. Laid out on trestle tables all around were cardboard boxes and plastic trays all full of damsons, plums, cooking apples, tomatoes and many different types and sizes of eggs. 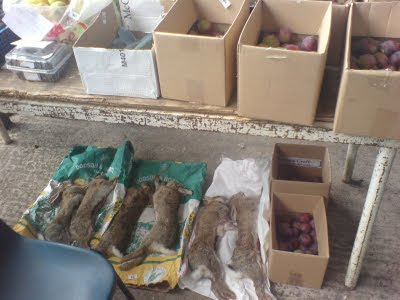 Underneath the tables were dozens of rabbits all laid out on cattle-feed sacks or in boxes to be sold at auction as well. Seeing all this made me happy. It was very nice to feel that the pleasure that I take in getting a rabbit for the table - or even a few damsons from a tree - are things that I could actually have in common with other human beings! I agree. They look good rabbits but shooting them myself means I know they have been gutted and skinned straight away. I may be wrong, but I believe the quicker the carcass cools the better the condition of the meat for eating. The rabbit skin when left on keeps a heat in carcass for some time. Still, rabbits presented in this manner are way better than Supermarket packaged meat. I just envy the fact that you can buy wild game there. There's a good reason we don't do it here in the U.S. - commercialization was wiping out some wildlife populations. But the laws ended up removing wild game from society's palate, and we now have a populace that is turned off by the flavor of an animal that lived a natural life, eating natural food. Unintended consequences! Thanks, Nick, that's very interesting.